When it comes to creams and skin care in general, I don’t think its too much to ask for the moon. I want miracles in a jar, and a pretty jar at that. I look for all-in-one formulas that offer multiple benefits in one swipe. With moisturisers, I’ve never found a favourite. I’m still looking for the one that ticks all my boxes. That said, I have a high opinion of Nip and Fab, and a couple of their items like the Glycolic Fix Pads rank among my all time favourites. They translate cutting edge concepts from their high end sister brand Rodial into affordable formulas without losing effectiveness. I also love anything to do with honey, so the Bee Sting Fix Deluxe Cream looked like a winner. Would it deliver? This is a cream that talks a good game. The coveted Bee Venom that can normally only be found in much pricier products is combined with wheat proteins to produce a plumped up, firmed appearance. There are a lot of skin goodies packed in here, and I also liked the promise the cream makes of an environmental shield that protects your skin from damaging pollution and ageing free radicals. I love the idea of being protected from fresh damage while also combatting the signs of damage already done. 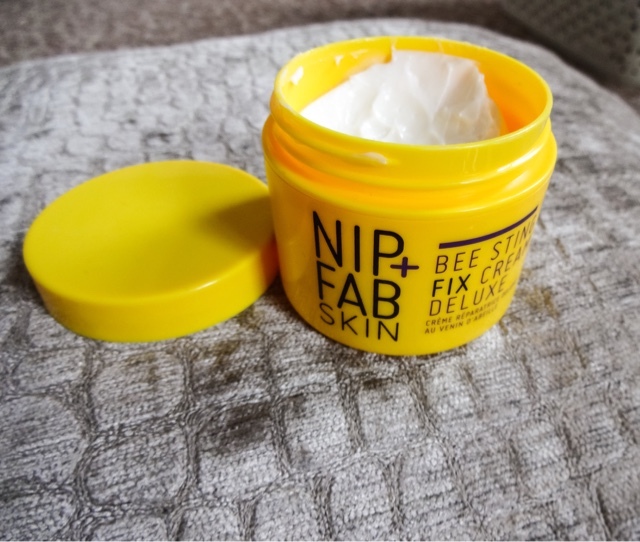 Nip and Fab stuff has a very distinctive look, and the whole Bee Venom line is packaged in a bright, eye-popping yellow plastic. It looks very fresh and youthful, but not the most sophisticated. I'd probably prefer something a little more refined personally, but it certainly stands out and the pot looks invitingly tactile, plus plastic makes for shatterproof and lightweight transportation. One minor niggle is that after a few weeks of use, all the writing melted off the pot into a smudged mess, which isn’t great. Bee ting Fix Deluxe Care is packed with great stuff for young skins concerned about ageing. First up, hyaluronic acid which is the best moisturiser around as it helps the skin to attract and retain moisture, giving that plumped up look. There’s Shea Butter, which strengthens and smooths out the skin and Vitamin E, a powerful antioxidant that guards against damage from free radicals. On the bee side of things, the venom is supposed to relax facial muscles, increase circulation to firm the skin and smooth out lines and wrinkles. There’s also Propolis, a substance bees harvest from pollen, and that is an antiseptic skin healer and a powerful antioxidant. This cream is beautiful to apply. Its quite a thick consistency, so those with oily skin may prefer it for night use only. I didn’t find it overpowering though, it sinks in very quickly and doesn’t leave any kind of residue at all. It smells beautiful, a lovely light honeyed floral smell that I would gladly wear as a perfume. My skin immediately felt soft and velvety after patting this on. And over time? Well, I’ve been using this for just over a month and my fine lines have definitely softened – although whether that’s down to this or the serum I’ve also been using is hard to call. I definitely feel like this makes my skin feel more hydrated and plumped up and I’m liking the combination of it with my other skincare. There’s a lot to like about this cream. Its a rich but lightweight formula that leaves skin feeling smooth and smells delicious. I’m definitely sold on the environmental shield aspect, I love the idea of my skin being protected. The lack of an SPF means this isn’t covering all the bases though. It sort of feels silly for any day cream not to include it. I also do not love the fact this comes in a jar. Exposure to the air diminishes the efficacy of active ingredients, so each time you open the jar, its damaging the cream, not to mention the waste of product getting trapped under nails, bacterial transference from fingers and all the rest. A pump would have been so much better. Despite this, the performance is good enough that Id definitely repurchase this, although I’m still searching for my holy grail cream- this is so close, but not quite perfection! I LOVE La-Roche-Posay moisteriser though- it's so light and beautiful!